Manufactured under ISO 9001 quality standards, are offered in a wide variety of sizes, ranges, and configurations to meet the demands of any application. 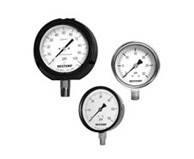 From the most rugged process gauges to the cost effect general purpose gauge, you can count on Reotemp pressure gauges for long and reliable service. Dial sizes: 1.5″, 2″, 2.5″, 3″, 3.5″, 4″, 4.5″, and 6″ dials are standard. Pointers: Balanced black aluminum pointers are standard on most models. Adjustable pointers are standard on series PR and PT, and are vailable on certain other models. Cases: Case materials are black steel, stainless steel, phenolic and ABS plastic. Series PC, PD, PH and PL cases are intended for dry service; all other cases can be filled at the factory, or in the field. Series PT features solid front design, which provides maximum safety with a solid wall between the window and the Bourdon tube. The entire rear of the case is designed to blow out and provide pressure relief should the Bourdon tube fail due to over pressure, corrosion or fatigue. Movements: The movement is the heart of the pressure gauge; its function is to accurately position the pointer in response to movement of the Bourdon tube. Reotemp movements are designed for smooth movement, low friction, and minimal play. Reotemp movements use high precision gears and low friction bearings to enhance performance, reduce hysteresis, and provide long-term accuracy and reliability. The effects of vibration on the movement can be reduced by liquid filling of the case, which both dampens movement, and lubricates contact points. For dry gauges, a special silicone dampened movement can be installed. Bourdon Tubes: To suit a variety of media applications, Reotemp Bourdon tubes are available in phosphor bronze, AISI 316 stainless steel, and monel. If the process fluid is not compatible with any of these materials, a chemical (diaphragm) seal may be necessary. Reotemp Bourdon tubes undergo special heat treating to reduce hysteresis effects, relieving localized stresses in the solder or weld zones and enhancing long-term accuracy of the gauge.